Elite 3.0 Protein Blend is the cleanest and most ethical protein blend in the world, made with Grass Fed SELECT (NZ) WPC, Free Range Egg White Powder and Grass Fed Micellar Casein MPI. Made up of fast, medium & slow releasing proteins in exactly 33.3% ratios of each it is also the most functional protein blend on the market. It is designed to give you an equal blend of three of the most powerful proteins available in order to create an environment of maximising protein synthesis for you to put on lean mass or diet down. It mixes easily with the aid of sunflower lecithin as its soy lecithin free making it ideal for those wanting to avoid soy. 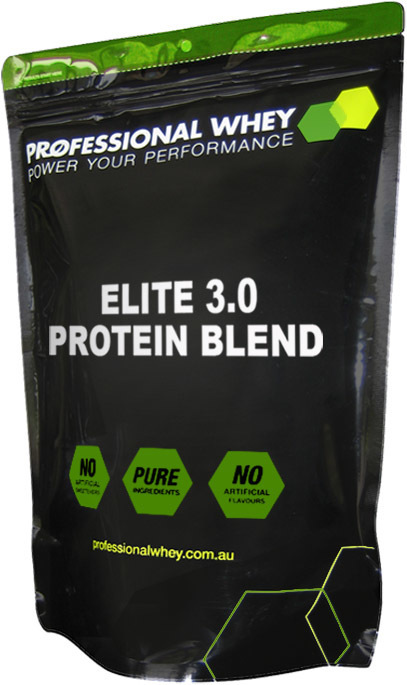 Mix 30g (one heaped scoop) Elite 3.0 Protein Blend into 250ml of milk or water until dissolved in a shaker. Use less liquid for a stronger taste and thicker consistency. Ingredients (Natural Flavour): NZ Whey Protein Concentrate, Egg Albumen, Milk Protein Isolate, Sunflower Lecithin. Ingredients (Organic Cacao Flavour): NZ Whey Protein Concentrate, Egg Albumen, Milk Protein Isolate, Organic Cacao, Sunflower Lecithin, Thaumatin (Natural Sweetener), Organic Stevia Extract (Natural Sweetener). Ingredients (Organic Vanilla Flavour): NZ Whey Protein Concentrate, Egg Albumen, Milk Protein Isolate, Organic Vanilla Bean, Sunflower Lecithin, Thaumatin (Natural Sweetener), Organic Stevia Extract (Natural Sweetener). Ingredients (Organic Cinnamon Flavour): NZ Whey Protein Concentrate, Egg Albumen, Milk Protein Isolate, Organic Cinnamon, Sunflower Lecithin, Thaumatin (Natural Sweetener), Organic Stevia Extract (Natural Sweetener). (Organic Cacao Mint Flavour) Ingredients: NZ Whey Protein Concentrate, Egg Albumen, Milk Protein Isolate, Organic Cacao, Sunflower Lecithin, Natural Peppermint Flavour, Thaumatin (Natural Sweetener), Organic Stevia Extract (Natural Sweetener). Allergens: Contains milk, dairy & egg products. Help other Professional Whey users shop smarter by writing reviews for products you have purchased.